Doll Bones by Holly Black. It’s been a while since I’ve reviewed a book for older kids. Now that school has begun, some (retail stores, especially) consider this the kick-off of fall and the Halloween season. If you are into creepy stuff, and especially if you are into creepy old dolls whose glass eyes seem to follow you, this is a wonderful read. Doll Bones is an interesting book, because it is a ghost story with substance. Partly, this story is about three adolescents, Poppy, Alice, and Zach. They are alway playing make-believe adventures, with long elaborate plots, all of which leads back to the Queen, a creepy old doll that Poppy’s mother keeps locked in a glass case. But it’s also about adolescence, about growing older and changing. It’s about that age where friends begin to grow apart, and where social pressures affect who you interact with and how you interact with them. 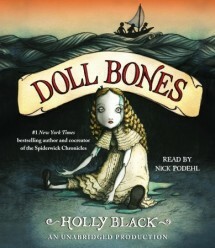 Part coming-of-age, part ghost story, part timeless adventure tale, Doll Bones is a finely crafted spooky story from Holly Black, the mind that brought the world The Spiderwick Chronicles. A definite must-read for lovers of scary stories and good young adult literature.